Located on Long Island's Gold Coast, Ambalu Jewelers carries a complete assortment of precious gemstone and diamond fashion jewelry set in 14K, 18K, platinum, and silver. We offer a wide array of styles including rings, earrings, pendants, bracelets, and necklaces with unparalleled quality. Create your dream engagement ring and wedding band with our complimentary in-house design service. At Ambalu Jewelers we proudly offer our exclusive bridal registry service and designer tabletop collections including Phillipe Deshoulieres, Rosenthal, Wedgewood, Rogaska, Vera Wang, Juliska and Ricci with fine giftwear from Michael Aram and Julia Knight, just to name a few. 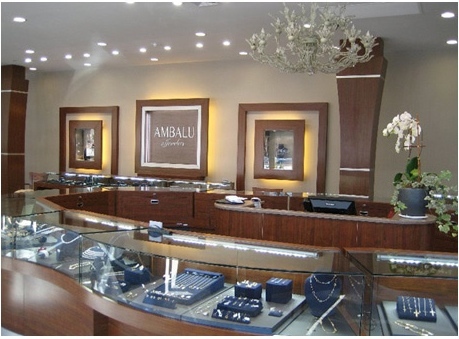 As your personal jeweler, Ambalu Jewelers always guarantees the best quality and value. Please consider the diamond experts at Ambalu Jewelers, your friends in the diamond business.